A bike-mounted police unit started operating in the southwest of Moscow in June. The Moscow Police Department has not been left out of the City Council’s initiative to “bicyclize” the Russian capital this summer. A bike-mounted police unit started operating in the southwest of the city in early June. So far, officers in full gear only patrol Bitsa Park, although more parks and other areas closed to cars are to follow suit shortly. Velobike, a joint bicycle-sharing project of the Mayor’s Office and the Bank of Moscow, started in Moscow on June 1, with bicycle rental racks appearing throughout the city. Just two weeks into the project, however, eight bikes have been stolen and around 20 vandalized, and users have complained about the complicated payment process (a credit card must be first registered at a special website). Nevertheless, Moscow police support the authorities’ plans to “bicyclize” the city, as RBC daily has learned. The serial killer Alexander Pichushkin, who murdered 48 people in Bitsa Forest Park and was sentenced to life in prison in 2007, is known to have taken advantage of the fact that police only patrolled the vast park area on foot for years. 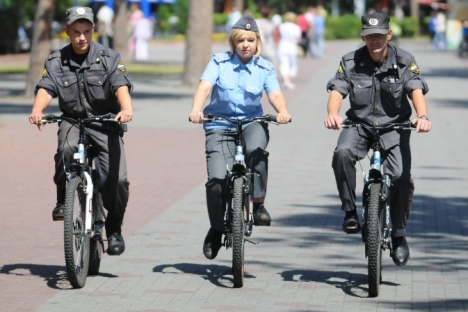 “While our officers patrol on motorcycles in Tsaritsyno, it’s more convenient for them to operate on bicycles at Bitsa Forest Park,” the Moscow Police Department’s press service said. The bicycle-mounted police are outfitted just like regular cops. They carry a GI gun, a flashlight, a radio and handcuffs at all times. According to Anosova, southwest Moscow will not be the only area patrolled by bike-mounted police. “We are talking about the whole of Moscow; the city’s police department has already discussed this idea,” she said. The article is first published in Russian in RBC Daily.